All displayed prices include V.A.T. Price of the booking fee as indicated in each accommodation reservation form has to be paid, and money has to be received by our My-Telaviv office. Upon payment good réception, you receive the final confirmation with your booking ticket. The payment of the booking fee is processed through a secured payment platform and all main credit cards are accepted. Bank transfer are also accepted- please contact our office should you select this payment mean. Important note: bank transfer can be agreed only for bookings made at least 7 days prior to arrival, this guarantees that the payment has properly been made. Any related cost to a bank transfer should be endorsed by the client. Your reservation is valid & confirmed upon the payment reception of the booking fee made online and accepted by our office. A confirmation mail is directly sent including all detailed information for your arrival in Tel-Aviv . This mail confirms your accommodation booking. The remaining balance is due in cash upon your arrival in My-Tel-aviv. 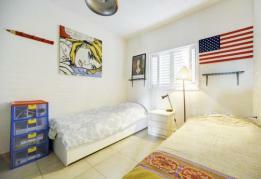 You will be greeted by the owner or representative directly at the accommodation address. Some properties accept credit card payment. Please be aware that additional cost may be required for using this payment mean. Any other payment mean accepted beside cash is specified in each booking confirmation. You can refer to your booking confirmation to know what payment mean is accepted upon your arrival. A security deposit of the amount specified in your booking reservation is required for most accommodation. The amount is defined according to each type of accommodation and guarantees the proper care of the accommodation premises and of the furniture and fittings therein. This amount shall be given in cash. In the event that the accommodation is left in the same condition as it was the day of arrival, the security deposit is refunded to the client. My-Telaviv is not responsible to any dispute arising from a security deposit refund. The owner or property manager of the accommodation has the right to refuse admittance to clients who do not pay the required security deposit. My-Telaviv uses all its available means to offer accurate on-line availability calendars. However, we cannot guarantee that at the moment we will process your booking request, the accommodation will still be valid. Our Company reserves the right to reject your booking demand and propose alternative solutions, without being responsible of any of the conséquences. The confirmation of the booking is conditioned by the acceptance of the payment of the service by credit card o whatever accepted other means of payment. 50 % (fifty percent) of the total amount due. The booking fee paid for the reservation of the accommodation cannot be reimbursed nor can it be transferred . This included “force majeure” circumstances. In the event that My-Telaviv should be unable to provide the property client has booked, we reserve the right to transfer client to a property of similar characteristics. • Number of guests according to the accommodation capacity. • Addition of nights according to the accommodation availability calendar. The first amendment of your booking réservation is free. Any additional change will be charged 30€ for administrative fee. All cancellations or changes must be communicated by mail. No request made by phone will be accepted. It is strongly recommended to our clients to get an insurance including a travel cancellation coverage. The accommodations are usually available for check-in from 15.00 pm. When ever possible and upon request, we can arrange for the accommodation to be available earlier. It is therefore important to know your arrival time as well as any change that might occur prior to your arrival. Please note that all arrivals later than 20.00 pm are submitted to an extra-charge of 50€ and 70 € for arrivals after 23.00 pm. The accommodation shall be used for individuals and business travellers as a holiday rental, the Accommodation should never be used for commercial activities without prior written acceptance of our company who mediates on behalf the property owner. Therefore, client declares that he/she is leasing the Accommodation for the purpose of spending his/her holidays, under no circumstances shall the Accommodation leased under the terms of the contract hereof be used on a habitual residential basis. The accommodation is cleaned prior to each client arrival. Bed linens and towels are provided for each guest occupant. When leaving, guests are required to leave the apartment in reasonable condition and take out the garbage. If this is not the case, the owner is entitled to ask for a compensation fee. 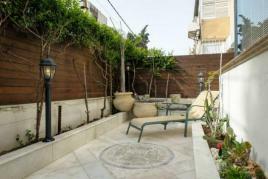 The client shall inform My-Telaviv of the number of guests who will occupy the accommodation booked. Unless otherwise agreed by My-Telaviv , only the number of persons indicated by the client when booking shall be authorized to stay in the accommodation. In the instance that the number of guests varies within one stay, the booking shall be made for the maximum number of guests who will occupy the accommodation. The number of guests who may stay in the accommodation shall not exceed the capacity authorized, except for children under three years old. Pets are only allowed when permission has specifically been granted. In the event of any infringement of the above mentioned obligations, My-Telaviv or the property owner are entitled to request the client to leave the accommodation. The client shall have no right to claim any type of compensation. Client shall keep and maintain the premises in good condition throughout rented period , and freely agrees to pay to the Owner present market prices in case of any damage or loss to said Accommodation, caused either by client or by any other guests living in the rented accommodation. The client booking the accommodation is liable for the correct and decent behavior of all the persons accompanying him/her. Should that person, or any of the person accompanying him/her not behave in a suitable and responsible way, My-Telaviv and/or the Owner shall be entitled to request the client and the persons accompanying him/her to leave the apartment without the right for the later to claim any type of compensation. Please respect your neighbors: Most of our apartments are located in private and residential buildings. Neighbours are normal working people who need to get up early and go to work every day. Therefore, please limit your noise level in the stairwells as well as in the apartment. ANY EXCESSIVE NOISE, LOUD MUSIC AND PARTIES ARE STRICTLY FORBIDDEN ! In case of complaints from the neighbors due to excessive noise or an annoying behavior from your side (or any people of the group), the owner has the right to expel from the apartment the client and all guests whether it is day time or night time,without any refund of the amount already paid for the reservation, and the security deposit will be kept by the owner. By booking with My-Telaviv- , the client shall agree with these terms & conditions. In addtion, any police fine should be at charge of the guest.